Welcome to AchooAllergy.com, one of the nation's fastest growing companies devoted to allergy, asthma, and sinus relief products. Since 2000, we have helped you by offering a wide selection of allergy relief products, by delivering excellent customer service, and by providing great information and resources about allergies and asthma. Our mission is to help make you healthier and happier through allergy relief. This Honeycomb Mask, or Honeycomb ACF Pollution Mask, is made with a disposable activated carbon filter that is sealed inside a comfortable lightweight frame. The carbon fabric works with inner layers of filtration material to trap these indoor and outdoor pollutants: fragrances, particles, cigarette soot, smog, dust, diesel fumes, formaldehyde. It also filters from 50% to 95% of household chemicals depending on the substance. So not only does it absorb vapors but it blocks allergens. The Honeycomb Mask was designed to effectively seal in the carbon filter. This filter does not replace industrial strength respirators and is not meant for extreme occupational exposure, but for most every day tasks, this mask is more than sufficient to filter common indoor and outdoor air pollution. Through testing, the honeycomb carbon face mask was shown to be comparable to a standard N95 mask in the filtration of particles 1.0 microns in size and larger. This face mask trapped 99-100% of particles in that size range. During travel, the disposable activated carbon filter cleans the recycled air on airplanes, trains, and buses. 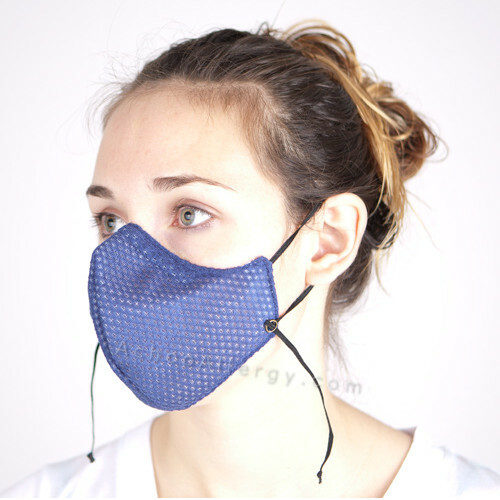 Latex free and built as one-size-fits-most, the Honeycomb Carbon Mask is the ideal companion for anyone with allergies, asthma, MCS.